The war being raged throughout Alita: Battle Angel is one built on the foundation of technical wizardry. In this world of CG imagery, VFX, native 3D filmmaking and bonker performance-capture technology, the emotional thrust of Battle Angel is focused on a Cyborg life form looking to fulfill her human potential. Based on the graphic novel series by Yukito Kishiro, the film adaptation of Alita: Battle Angel is directed by the legendary Robert Rodriguez and tells the story of Alita, the titular cyborg with a human brain who goes on a journey to recover her memories and find her place in a dystopian world. 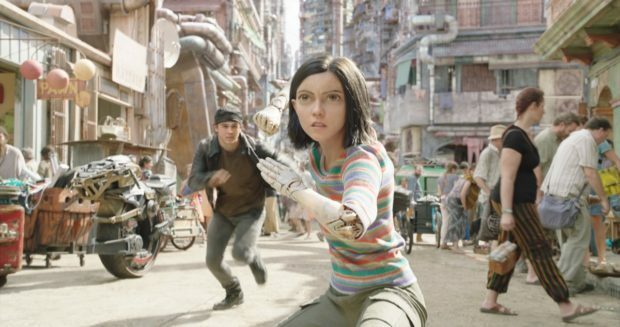 Much of the marketing and hype behind Alita: Battle Angel has been dedicated to the visual aspects of the film with good reason. This film is gorgeous. And it’s the little things, the subtle lighting effects that highlight the human qualities of Alita, tricking your brain in the process. Or how about her teeth? Yes that’s right, I don’t entirely know what the team at WETA Digital did, but Alita’s teeth, and facial animations in general, are breathtaking. 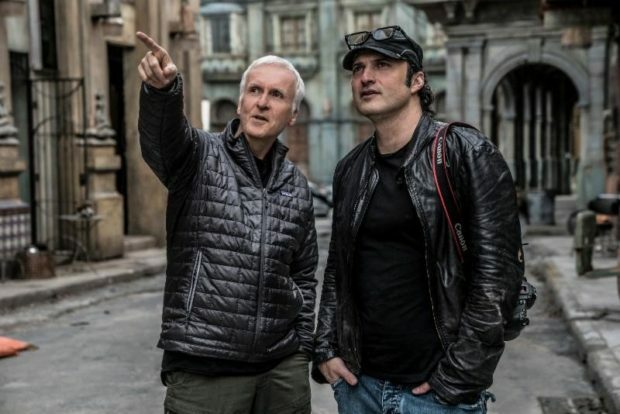 Writer/Producer James Cameron and Director Robert Rodriguez on the set of Alita: Battle Angel. The fantastic visuals rest on the partnership between Rodriguez’s Austin-based Troublemaker Studios, Cameron’s Manhattan Beach-based Lightstorm Entertainment and the aforementioned WETA Digital. As the creators of all things motion capture for the last 20 years, whether Gollum from Lord of the Rings, Cesar from Planet of the Apes or the worlds of Avatar, WETA had a hand in creating all of it. The use of real-time digital capture of the human face, allowed for an actor’s natural expressions to be fully mapped and translated—in this case actress Rosa Salazar—into the Alita character we seen on screen. They remain the leaders of the field. “Weta still does the best facial animation of anybody out there—the most human, the most alive, the most emotional. So many other houses are trying to catch up, but Weta remains in front. I knew they had to do Alita, because you have to believe in her even in the tightest close-ups,” said Cameron. From more efficient workflows, versatile digital lighting and an improved ability to simulate muscles and skin – it was all vital to infusing Salazar’s performance into Alita’s CG body. “We’re now able to work at the level of the facial musculature—so it’s no longer about just moving the surface skin but moving the underlying muscles. 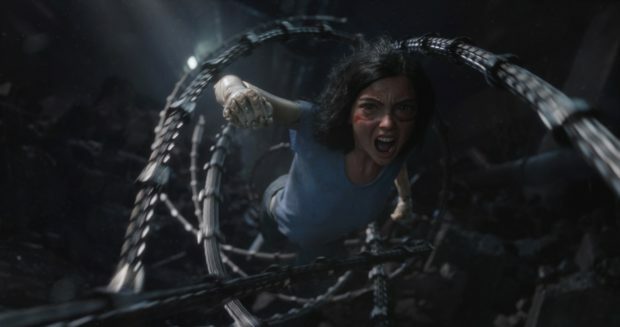 You can see it in how the movements of Alita’s face look so much like Rosa’s,” said visual effects supervisor Eric Saindon. Actress Rosa Salazar plays Alita, the most realistic CGI persona we’ve seen on screen. Speaking of Salazar, the film begins with her cybernetic body buried in the gigantic trash heap of Iron City. It’s here where we meet cyber physician Dr. Dyson Ido (played by the always capable Christoph Waltz) who stumbles across the broken shell of Alita while scavenging for parts for his robotics medical clinic. The narrative focus of Alita: Battle Angel is her quest for knowledge, which includes learning more about Zalem, the last of the great Sky cities, a floating city located right above her. A budding love interest in Hugo—played by actor Keenan Johnson—introduces her to motorball, a a violent take on robotic roller derby in which the champion earns a trip to Zalem. It’s from these various motorball scenes that some of the most interesting moments of the film derive. Coupled with breathtaking fight scenes that blend live-action and CGI, and Alita: Battle Angel is fun from start to finish. The eventual relationship between Hugo and Alita is cheesy until it’s not. Cameron’s script does a great job of giving his bad boy sweetheart image an important emotional hook that pays off well in the third act. It’s pretty easy to tell that Alita: Battle Angel is really pushing Salazar and Johnson as the next big thing; how it’s actually decided is irrelevant but I’m excited for what the two have in store. The film takes a variety of turns, some unsurprising but a few, towards the back half, that left me emotionally invested and genuinely excited for a sequel. The arc of the film is fairly routine; person x wakes up with crazy powers (or in this case a cybernetic body/human brain combo) but can’t answer the how/why because of acute memory loss. This isn’t to say the narrative of Alita: Battle Angel is bad, it’s just comfortable with a few well-earned surprises. The performances are great throughout, and only a few feel underutilized – mainly Jennifer Connelly as a conflicted scientist. The filmmakers set her character up nicely but surface level is as far as we get. Waltz, as per usual, plays perfunctory concern with great oomph. I could listen to him recite the dictionary. The other underused performance is that of Mahershala Ali’s Vector, a bad guy who’s always been too cool for school. Ali does what he can, but Vector is little more than one-liner threats or bemused looks. The performance does work from the perspective of a Vector as a puppet, with the late game, meta bad guy is revealed in the closing moments. Alita: Battle Angel is filled with jaw-dropping special effects and creative camera work. The world of Alita: Battle Angel feels lived in and the world building is strong – a testament to Kishiro’s original source material. There’s established rules and codes of conduct on the streets of Iron City, and the history of the long-gestating war are baked into its walls. Concept art for the film started a decade ago with Ben Procter and Dylan Cole, co-production designers on the Avatar sequels, taking on the challenge of serving as concept design supervisors for Alita: Battle Angel. The concept art included massive sets the filmmakers created on the lot of Troublemaker. These demanded all manner of logistical parameters—each space had to be constructed to accommodate the unwieldy performance-capture process. But the main focus was on something else: to generate an environment visceral enough to transport the actors to a fresh reality. One obsession that unites the people of Iron City it is Motorball: the glam and brutal gladiatorial sport whose champions are the heroes of an otherwise desperate city. The game takes place on rocket-propelled wheels, as hulking cyborgs fitted with chains, spikes, blades and armour race at 100-mph through the hairpin turns of a trap-filled track designed to damage cyborg parts. Those who win at Motorball not only attain rock star status in Iron City but a chance to ascend to Zalem forever. For the street Motorball sequences, the production recruited a quartet of world-class inline skaters to take on the parkour-like moves that needed to be captured. Still, many of the pro Motorball characters had to be almost entirely computer-animated because there simply is no human analog for the way they move. “Some of our characters just don’t work like humans do, so you can’t really even performance-capture them,” notes Richard Hollander. When Alita: Battle Angel hits Cineplex theatres on February 14 I will be lined up for a second viewing. As big fan of manga and anime and general, this movie is a great adaption that does enough to explain its world without losing all of the subtle complexities of the source material. While in no way a perfect film—there’s some definite pacing issues—its a visual spectacle the like I haven’t seen in years.